Articulating dump trucks provide the tighter turning radius and pivoting capabilities that are essential in mining and other heavy-duty off-highway material loading and transporting applications. Caterpillar®, the world’s most trusted heavy equipment provider for nearly a century, leads the way when it comes to articulating truck innovation. Cat® vehicles are built for large jobs. In addition to their world-class power and performance, they feature easy operation and automotive-style comfort that will keep your workers productive throughout a long day on the job. For additional details, download our Rental Brochure. Call us today at (317) 803-2526 for more info on articulated dump truck rentals. Looking for smaller dump truck rentals? Visit MacAllister Rentals for on-highway dump trucks. Are you looking for a reliable articulating truck on a temporary basis in Indiana? MacAllister Machinery can help. We carry a large selection of Cat articulating trucks you can rent for a day, week, month or longer. Our inventory includes various models of three-axle trucks in a wide range of sizes, configurations and load capacities. Our knowledgeable equipment rental staff can assist you in choosing the right machine for your applications and budget. 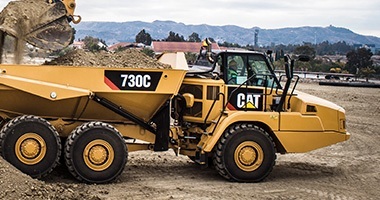 When Should You Consider a Large Dump Truck Rental? Renting an articulating truck can provide an excellent alternative to buying if you’re looking for a vehicle for the short term, long term or anything in between. Many companies in Indiana come to MacAllister Machinery for a fast replacement of a truck that’s temporarily out of service or when an unexpected project comes their way. Renting also makes sense if you must bolster your fleet for your busy season or have numerous projects taking place at once. Operating and ownership costs are yet another factor. When you rent, you don’t have to worry about paying for upkeep and storage. And renting is a viable solution if you want to try out a new piece of equipment before making a purchasing commitment. Why Choose an Articulating Truck Rental From MacAllister Machinery? MacAllister Machinery is one of the most respected and reputable heavy equipment dealers in the region since 1945. We will stand behind your large dump truck rentals just as we’ve done with every machine we’ve sold, leased or rented over the past 70+ years. Please take a minute to browse our heavy rental product guide to explore our current articulating truck rental offerings. Feel free to give us a call or contact us online for additional product information and a free quote.